PLANT NAME:Centella asiatica (L.) Urb. COMMON NAMES: Pohe kula [Hawai’i]; gotu kola, marsh pennywort [USA]; ji xue cao (“accumulated snow”), luo dei da (“drop will strike”), ma ti cao (“horse’s hoof”) [China]; mandukaparni, muttil, kutannal [India]; kapukapu [Cook Islands]; tohetupou [Tahiti]; ghod tapre [Nepal]; totodro [Fiji]; tono [Samoa, Tonga]. Centella is derived from the Latin “centrum,” meaning prickle. The fruit of Centella resembles two tiny needles. The Chinese name luo dei da (“drop will strike”) is a reference to pohe kula’s use for bruises, sprains and injuries. 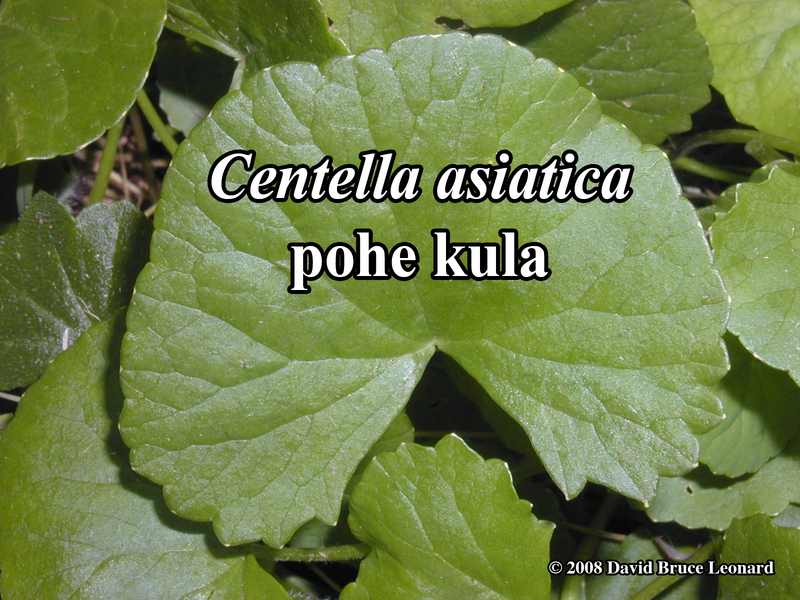 In Hawaiian, Hydrocotyle verticillata is called pohe, Tropaeolum majus is called pohe haole, and Centella asiatica is called pohe kula, or sometimes pohe for short. CATEGORY: Clear heat, cool the blood. PROPERTIES: Sweet, bland, pungent. Bitter but tasty. Cool to cold. PLANT PART USED: Whole plant. CAUTIONS AND CONTRAINDICATIONS: Some sources state that Centella may reduce fertility in animal studies, thins the blood, and may be hypoglycemic. I could not verify any of this with research studies, but I would not use it in pregnancy or with blood thinners. See Possible Drug Interactions. PREPARATION OF MEDICINE: Fresh or dried. Can be put in salads in small doses. STATUS IN HAWAI’I: Alien. Pest factor is minimal to moderate. MERIDIAN AFFINITIES: Liver, spleen, kidney, heart, lung, large intestine. WESTERN FUNCTIONS REPORTED: Alterative; analgesic; antidepressant; antimicrobial; antitoxic; antiviral; anodyne; anti-infectious; antipyretic; aphrodisiac; astringent; diuretic; immunomodulatory; improves circulation; increases longevity; insecticide; narcotic; nervine; refrigerant; sedative; stimulant; tonic; veterinary lactogogue. Bleeding [China]; varicose veins [Europe]; hypertension; venous insufficiency. Pregnancy-related stretch marks (striae gravidarum). Stomachache [Fiji (leaf juice)]; abdominal pain [China]; peptic ulcer [India]; bleeding ulcer [Fiji (leaf juice)]. Diarrhea [China]; dysentery [China, Philippines, South Pacific]; indigestion [Nepal, General]; vomiting [China]. Juiced for eye ailments and nasally for migraines [Tonga]; red eyes [China]; cataract [India]; eye problems [Fiji (leaf juice), India, Samoa]. Headache [Philippines, South Pacific]; migraines [Samoa]. Boils, fistulas, furuncles and carbuncles with toxic swelling [China, Samoa]. Fever [China (high fever), India, Philippines, South Pacific]; chills and fever that come and go each season [China]. Trauma, falls, contusion [China]; wounds [Indonesia, Philippines]; fractures [China, Fiji (leaves and coconut oil)]. Rheumatism [Nepal]; painful and swollen joints [Fiji (leaf juice)]; spasms [Turkey]. Cold extremities, white fingers [Hawai’i]. Cancer [Mauritius]; abdominal tumor [India]; uterine cancer [Brazil]. Delayed closure of the fonatel [Tonga (leaves poulticed)]. Childhood tidal fevers [China]; childhood convulsions [Fiji (leaf juice)]. Navel infection in babies [Tonga (leaves poulticed)]. Poor memory [Hawai’i, India, Nepal]. Venereal disease [Samoa]; syphillis [Nepal]. Post partum weakness [Fiji (leaf juice)]. Unwanted pregnancy [Fiji (leaves in combination)]. Asthma, bronchitis; respiratory problems [China]. Tuberculosis; coughing blood [China]; pleurisy [China]. Urinary difficulty with stones or bleeding [China]. Used for arsenic poisoning [China]. Aversion / fear of cold [China]. Hansen’s Disease (leprosy) [Brazil, China, India, Malagasy, Nepal, Samoa, Turkey]. USE AS FOOD: Edible, but I wouldn’t eat more than 3-4 leaves per day. CONSTITUENTS: 3 glucosylkaempferol, 3 glucosylquercetin, 7 glucosylkaempferol, alpha alanine, aluminum, aminobutyrate,ascorbic acid, asiatic acid, asiaticoside, aspartic acid, beta carotene, beta caryophyllene, beta elemene, beta farnesene, beta sitosterol, betulic acid, betulinic acid, bicycloelemene, brahmic acid, brahminoside, brahmoside, calcium, campesterol, camphor, carbohydrates, centellic acid, centellinic acid, centellose, centelloside, centoic acid, chromium, cineole, cobalt, elaidic acid, essential oils, fat, fiber, germacrene, germacrene-d, glucose, glutamic acid, glycine, histidine, hydrocotyline, indocentelloside, indocentoic acid, inositol, iron, isobrahmic acid, isothankunic acid, isothankuniside, kaempferol, lignoceric acid, linoleic acid, lysine, madasiatic acid, madecassic acid, madecassoside, magnesium, manganese, medicassic acid, mesoinosital, methanol, myo inositol, n-dodecane, niacin, oleic acid, oxyasiaticoside, palmitic acid, p-cymol, pectin, pyridoxin (B6), phosphorus, potassium, protein, raffinose, rhamnose, riboflavin (B2), saponin, selenium, serine, silicon, sodium, stearic acid, stigmasterol, thankunic acid, thankuniside, thiamine (B1), threonine, tin, trans beta farnesene, vellarine, zinc. Skin disorders:Add Trifolium praetense (red clover) and Oxalis spp. (‘ihi). Impotence: Add Bacopa monnieri (brahmi). Low immunity:Add Trametes versicolor (yun zhi) and Morinda citrifolia (noni). Poor memory or heart disease:add Bacopa monnieri (brahmi). Toxic swelling: Topical with salt [China]. Bleeding: 30 grams with Eclipta prostrata (han lian cao) [China]. Sore throat: Mix juice with vinegar [China]. Vomiting blood or blood in urine: With Eclipta prostrata (han lian cao) and Biota orientalis leaves [China]. Food poisoning: With Ipomoea reptans (water spinach) [China]. RANGE: From Australia and New Zealand, to South America and South Africa. Native to Asia. HABITAT: In Hawai’i, (if it’s not too dry) somewhere in your yard. Grows from sea level to 5000′. PROPAGATION & CULTIVATION: No need. Antimicrobial:Constituents are antimicrobial in vitro and in vivo against Mycobacterium leprae and Mycobacterium tuberculosis [Medda 1995] May inhibit Herpes Simplex II Virus [Zheng 1989]. Cancer:Cytotoxic against Dalton’s lymphoma ascites tumor and Erlich ascites tumor in mice [Babu & Kuttan 1995]. Cardiovascular:Demonstrates significant improvement in chronic insufficiency of the veins [Incandela & Cesarone 2001(c)], possibly through modifying mucopolysaccharidemetabolism [Arpaia 1990]. It improves microcirculation in diabetics [Cesarone, Incandela, De Sanctis, & Bavera 2001(b)] and in airline passengers with varicose veins [Cesarone, Incandela, De Sanctis & Belcaro 2001(c)]. It is effective for venous hypertension [Belcaro 1990; Incandela, Belcaro, & De Sanctis 2001(a)] and secondary leg edema [Cesarone, Belcaro, & Rulo 2001(a)]. Constituents reduce atherosclerotic plaques in humans [Incandela, Belcaro & Nicolaides 2001(b)]. Cognitive:Various Centella extractions may increase cognition in rats [Veerendra 2003; Gupta 2003]. Certain asiatic acid derivatives are neuroprotective in rats, as well as being anti-oxidant and neuroprotective [Lee 2000(c), Veerendra 2003]. Digestion:Reduces digestive ulcer formation in rats [Cheng / Koo 2000; Cheng / Guo 2004; Sairam 2001; Chatterjee 1992]. Wounds:Centella is often used to speed the healing of wounds. Constituents speed wound healing in guinea pigs, [Shukla 1999] in rats, [Suguna 1996; Sunilkumar 1998] and increase human skin collagen levels in vitro [Bonte 1994, 1995; Maquart 1990]. Ingredients appear to be able to alter collagen production in such a way as to inhibit formation of hypertrophic scars, keloids, and stretch marks (striae gravidarum / striae distensae) [Bosse 1979; Widgerow 2000]. Legend has it that gotu kola was introduced to Hawai’i as medicine by a victim of Hansen’s Disease (leprosy) who had cured himself of the affliction. Called “Küpuna medicine” (“Elders medicine”) in Hawai’i because of its function of improving memory. Babu TD, Kuttan G, Padikkala J. 1995. Cytotoxic and anti-tumour properties of certain taxa of Umbelliferae with special reference to Centella asiatica (L.) Urban. J Ethnopharmacol. Aug 11;48(1):53-7. Belcaro GV, Rulo A, Grimaldi R. 1990. Capillary filtration and ankle edema in patients with venous hypertension treated with TTFCA. Angiology. Jan;41(1):12-8. Bonte F, Dumas M, et al. 1994. Influence of asiatic acid, madecassic acid, and asiaticoside on human collagen I synthesis. Planta Med. Apr;60(2):133-5. Bonte F, Dumas M, et al. 1995. Comparative activity of asiaticoside and madecassoside on type I and III collagen synthesis by cultured human fibroblasts. (Article in French) Ann Pharm Fr.;53(1):38-42. Bosse JP, Papillon J, et al. 1979. Clinical study of a new antikeloid agent. Ann Plast Surg. Jul;3(1):13-21. Brinkhaus B, Lindner M, Schuppan D, et al. 2000. Chemical, pharmacological and clinical profile of the East Asian medicial plant Centella asiatica. Phytomedicine 7(5): 427-448. Cesarone MR, Belcaro G, Rulo A, et al 2001. Microcirculatory effects of total triterpenic fraction of Centella asiatica in chronic venous hypertension: measurement by laser Doppler, TcPO2-CO2, and leg volumetry. Angiology. Oct;52 Suppl 2:S45-8. Cesarone MR, Incandela L, De Sanctis MT, Bavera P, et al. 2001. Evaluation of treatment of diabetic microangiopathy with total triterpenic fraction of Centella asiatica: a clinical prospective randomized trial with a microcirculatory model. Angiology. Oct;52 Suppl 2:S49-54. Cesarone MR, Incandela L, De Sanctis MT, Belcaro G, et al. 2001. Flight microangiopathy in medium- to long-distance flights: prevention of edema and microcirculation alterations with total triterpenic fraction of Centella asiatica. Angiology. Oct;52 Suppl 2:S33-7. Chatterjee TK, Chakraborty A, et al. 1992. Effects of plant extract Centella asiatica (Linn.) on cold restraint stress ulcer in rats. Indian J Exp Biol. Oct;30(10):889-91. Cheng CL, Guo JS, et al. 2004. The healing effects of Centella extract and asiaticoside on acetic acid induced gastric ulcers in rats. Life Sci. Mar 19;74(18):2237-49. Cheng CL, Koo MW. 2000. Effects of Centella asiatica on ethanol induced gastric mucosal lesions in rats. Life Sci. Oct 13;67(21):2647-53. Chevallier, Andrew. 1996. The Encyclopedia of Medicinal Plants. New York: DK Publishing Inc.
Gupta YK, Veerendra Kumar MH, Srivastava AK. 2003. Effect of Centella asiatica on pentylenetetrazole-induced kindling, cognition and oxidative stress in rats. Pharmacol Biochem Behav. Feb;74(3):579-85. Incandela L, Belcaro G, De Sanctis MT, et al. 2001. Total triterpenic fraction of Centella asiatica in the treatment of venous hypertension: a clinical, prospective, randomized trial using a combined microcirculatory model. Angiology. Oct;52 Suppl 2:S61-7. Incandela L, Belcaro G, Nicolaides AN et al. 2001. Modification of the echogenicity of femoral plaques after treatment with total triterpenic fraction of Centella asiatica: a prospective, randomized, placebo-controlled trial. Angiology. Oct;52 Suppl 2:S69-73. Incandela L, Cesarone MR, et al. 2001. Total triterpenic fraction of Centella asiatica in chronic venous insufficiency and in high-perfusion microangiopathy. Angiology. Oct;52 Suppl 2:S9-13. Lee MK, Kim SR, et al. 2000. Asiatic acid derivatives protect cultured cortical neurons from glutamate-induced excitotoxicity. Res Commun Mol Pathol Pharmacol. Jul-Aug;108(1-2):75-86. Maquart FX, Bellon G, et al. 1990. Stimulation of collagen synthesis in fibroblast cultures by a triterpene extracted from Centella asiatica. Connect Tissue Res.;24(2):107-20. Medda S, Das N, Mahato SB, et al. 1995. Glycoside-bearing liposomal delivery systems against macrophage-associated disorders involving Mycobacterium leprae and Mycobacterium tuberculosis. Indian J Biochem Biophys. Jun;32(3):147-51. Moore, Michael. Plant tincture brochure. Sairam K, Rao CV, Goel RK. 2001. Effect of Centella asiatica Linn on physical and chemical factors induced gastric ulceration and secretion in rats. Indian J Exp Biol. Feb;39(2):137-42. Shukla A, Rasik AM, Jain GK, et al. 1999. In vitro and in vivo wound healing activity of asiaticoside isolated from Centella asiatica. J Ethnopharmacol. Apr;65(1):1-11. Suguna L, Sivakumar P, Chandrakasan G. 1996. Effects of Centella asiatica extract on dermal wound healing in rats. Indian J Exp Biol. Dec;34(12):1208-11. Sunilkumar, Parameshwaraiah S, Shivakumar HG. 1998. Evaluation of topical formulations of aqueous extract of Centella asiatica on open wounds in rats. Indian J Exp Biol. Jun;36(6):569-72. Translation of A Barefoot Doctor’s Manual. 1977. Philadelphia: Running Press. Wagner, Warren L., et al. 1999. Manual of the Flowering Plants of Hawai’i. Volumes 1 & 2. Revised ed. Honolulu: University of Hawai’i Press. World Health Organization. 1998. Medicinal Plants in the Pacific. WHO Regional Publications. Western Pacific Series No. 19. Veerendra Kumar MH, Gupta YK. 2003. Effect of Centella asiatica on cognition and oxidative stress in an intracerebroventricular streptozotocin model of Alzheimer’s disease in rats. Clin Exp Pharmacol Physiol. May-Jun;30(5-6):336-42. Widgerow AD, Chait LA, et al. 2000. New innovations in scar management. Aesthetic Plast Surg. May-Jun;24(3):227-34. Zheng MS. 1989 An experimental study of the anti-HSV-II action of 500 herbal drugs. J Tradit Chin Med. 9(2):113-6.